With the 2010-11 NFL regular season having come to a close, a number of Florida Gators participated in Week 17 action, some of whom had an impact on their team’s performance.OGGOA has checked and re-checked the box scores to bring you a summary of what these Gators accomplished during the final week of the regular season. 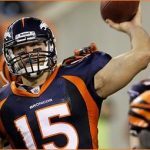 – Tebow started his third consecutive game for Denver but posted his worst QB rating even though he scored three touchdowns. – After being held without a reception in eight of Cincinnati’s first 13 games (due to his spot on the depth chart), Caldwell has posted 89, 87 and 94 yards, respectively, in the last three games. – Dunlap has registered at least a partial sack in seven of his last eight games. He has now earned 9.5 over the course of his rookie season. – Latsko was signed as a free agent this week and registered his first – and only – playing time of the season. – In one play during the Denver-San Diego game, Tebow completed a pass to Gaffney who was tackled by Siler. Siler also got some good shots on Tebow during the contest. – Injuries: Pouncey suffered a neck stinger during the Steelers game, and Thomas left the Broncos game with a right groin injury and did not return. – Wynn was released by the 49ers and signed by the Saints on Monday. he accounted for nearly 300 yards.